1. Preheat oven to 350 degrees. Lightly grease one 9×13 baking pan. 2. In a large bowl, combine pumpkin, milk, eggs, sugar, pumpkin pie spice, and salt. Mix well and spread into the prepared pan. 3. Sprinkle cake mix over the top of the pumpkin mixture and pat down. 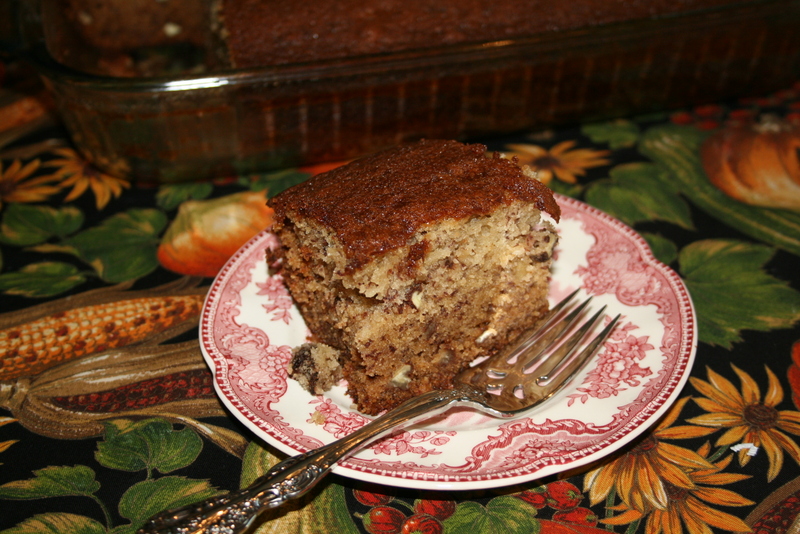 Sprinkle copped pecans evenly over the cake mix, and then drizzle with melted margarine. 4. Bake for 60 to 80 minutes or until done. Top with whipped topping when ready to serve. Note: I only baked for 1 hour. * I never have buttermilk and I always make some “sour milk”. You take one cup of regular milk and 1 tablespoon of vinegar and set aside for about 5 minutes. It actually curdles. Mix as given. You can use 2 bread pans or 9×13 inch pan. Bake at 325 degrees for 45 minutes to 1 ½ hours till brown on top. Very moist cake, cool and slice. 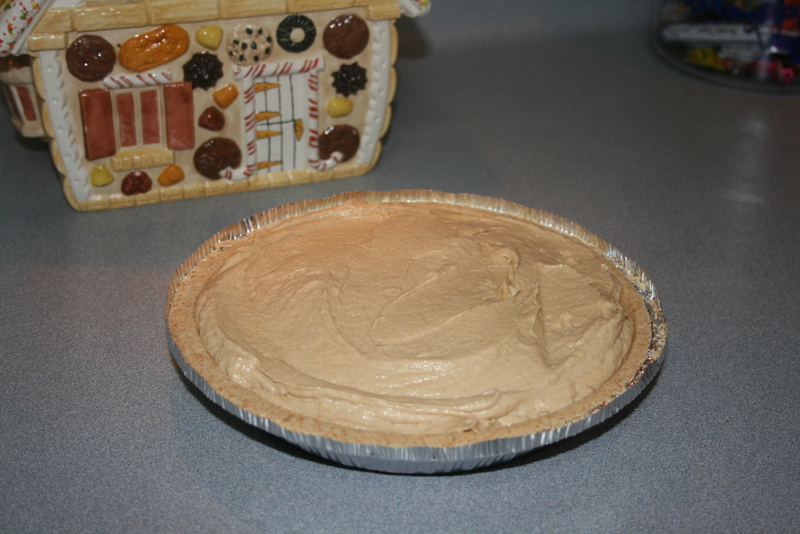 Mix and pour into uncooked pie crust. Mix together and place in piecrust top with the remainder of the Cool whip. I plan to top with dash of Cool whip and I just may have to drizzle some chocolate syrup on top. What is peanut butter without some chocolate? Remove from heat and stir in 3 ounces of strawberry Jell-O. 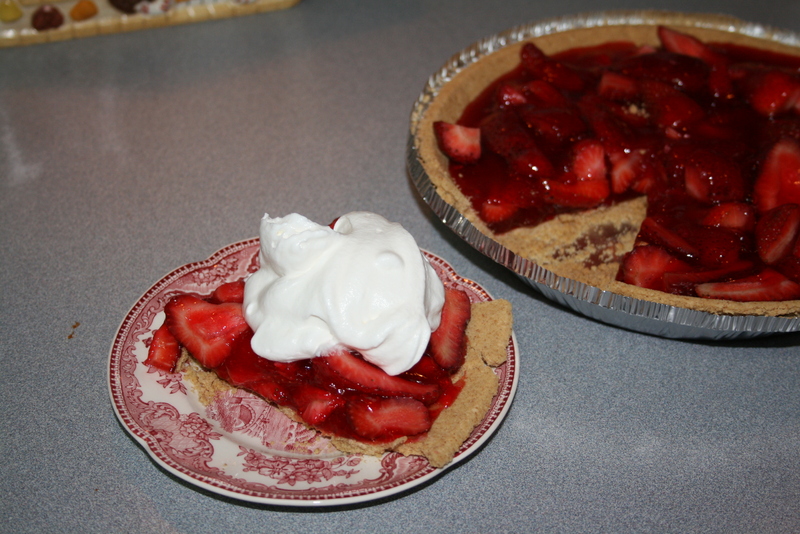 Pour warm mixture over berries in pie shell, I chilled and served with whipped topping. Bring to a boil, then add 1 cup of quick cooking oatmeal. Let stand, covered while combining the other ingredients. Mix well, then add oatmeal mixture. Grease and flour a 9 x 13 pan, pour mixture in pan and bake at 325 degrees for 35-40 minutes or until toothpick comes out clean. Put in pan 1 stick of margarine, ¾ cup of sugar, 1/4 cup of can milk. 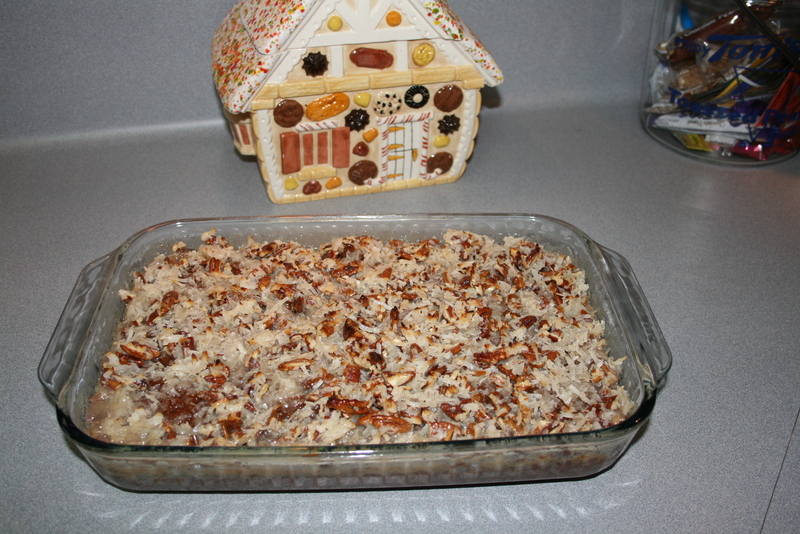 Bring to a boil; add 1 teaspoon of vanilla, 1 cup of coconut and 1 cup of chopped pecans. Pour over hot cake and BROIL the icing. About 3-4 minutes. You want it golden brown. When potatoes are almost soft, drain off all water and add to the mixture in the bowl. Pour all into a 9 x13 baking dish and cook for about 30 minutes at 350 degrees. This recipe you can make bigger or smaller, so fix potatoes as you need. Take approximately 2/3’s box of graham cracker crumbs, ½ cup of sugar and 1-½ sticks of melted butter or margarine. Mix well and place in 9×13 pan, pack it down and bake for about 8-10 minutes at 350. Set aside and let cool. Beat eggs, sugar, vanilla and butter for about 15 minutes. Place on top of the cooled crust. Slice bananas lengthwise and lay on the filling. Then place pineapple over bananas, spread cool whip and then garnish with pecans and place cherries, as you prefer. Place in refrigerator for about an hour or so. Slice and serve! Can use two pork tenderloins; I used 3.5 pound pork loin roast. Put the pork in the crockpot, I salt and peppered it, along with some garlic powder. Pour a can of root beer over the top, almost covering the meat. Cook for about 6 hours on low. Adjust the amount to your preference. Some like more sauce than others. Serve on small Hawaiian buns or whatever your preference is. I also put pickles and onions – it is whatever you like for your toppings. Boil according to directions, approximately 20 minutes. In a small pan, melt one stick of margarine or butter. Slowly add one cup of milk. If you pour the entire cup of milk at one time it takes a little longer to get the paste mixture. After the corn has boiled, drain all the water off. Pour corn into a bowl, add your paste, mix well. Bake in oven for about 20-30 minutes at 350 degrees. Ingredients are one pound of sausage, one 8-ounce package of cream cheese and one can of crescent rolls. Brown the sausage (drain off grease) and then mix with softened cream cheese. Mix well and set aside. Take the rolls, roll them out into only 2 sections – you will need to pinch the other sections together to end up with 2. After you get them laid out, take your mixture and spread the cream cheese/sausage on top of the 2 sections. Roll it up like a jellyroll. You have 2 rolls. After you roll it up, slice and bake for 20 minutes or golden brown at 350 degrees. Normally, we make them the night before and refrigerate, then slice and bake. It is what makes it easy for you. Nonetheless, they are wonderful, a crowd pleaser for any gathering! We usually double the recipe – the pictures are a double recipe. 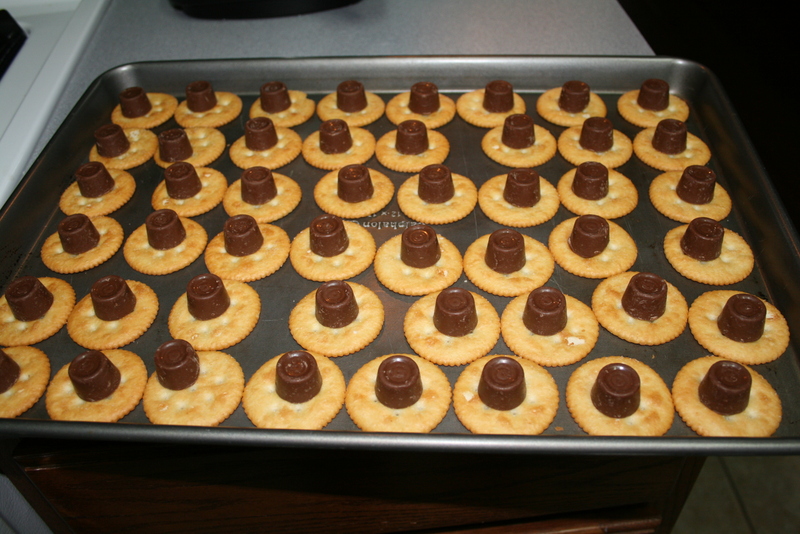 I did manage to make a recipe of Ritz Rolo Bites. They are pretty good and VERY easy! 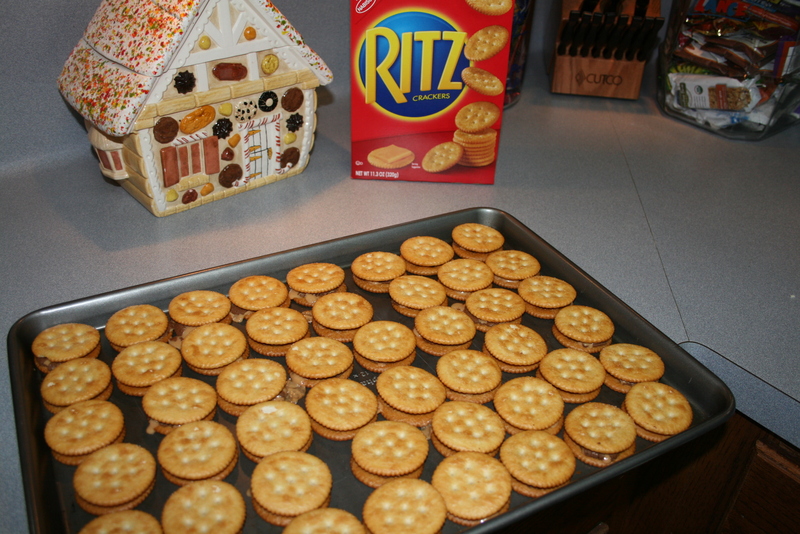 You take Ritz crackers place them on a cookie sheet and unwrap Rolos, place them on the crackers, bake until they melt, then top them with another cracker. Cool and eat! My cousin, Tanya made these for our cousin retreat – very tasty! Boy! These all sound so good!! you are very welcome! 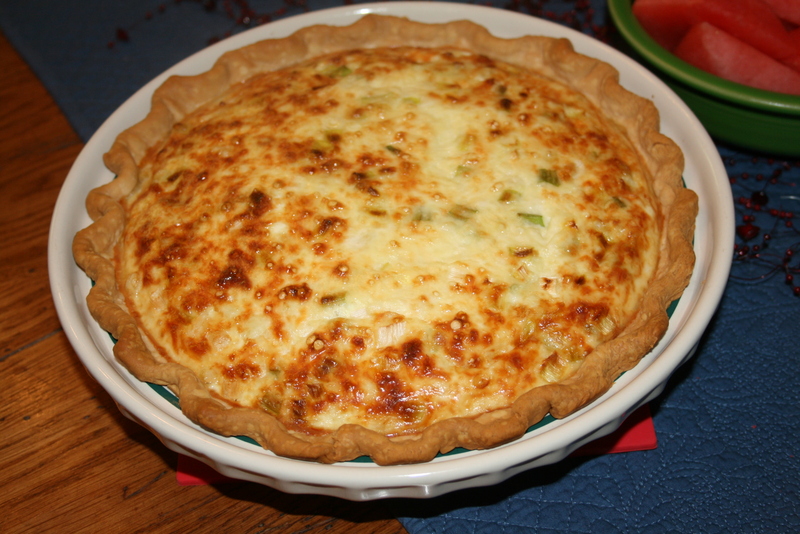 they are all great recipes, I hope you enjoy them as we have!